Vision is certified as a Small Business Concern (SBC) and our certs and reps are current on ORCA and CCR. Vision Electronics, Inc. has a huge stock of electrical and electronics parts ready to ship. We have a large supply of computer hardware and electronics due to our many connections with trusted sources throughout the United States and worldwide. Our goal is to help you improve your business operations with an effective flow of the necessary parts you need to keep building. This is why we offer one of the largest and most comprehensive inventory lists of active and passive electronic components. All three under a Top-Notch Quality Management System (Certified by NQA). 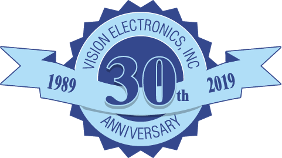 Vision Electronics, Inc. in Altamonte Springs, Florida, is an independent active and passive electronic components distributor. We sell computer peripherals and have Quality Management System is certified ISO 9001:2015 ANSI/ESD S20.20-2014 and comply AS9120 Aerospace. Our goal is to meet and exceed all expectations of what we supply to our customers. Our promise is to continually improve the effectiveness of our quality management system. Make us your distributor and place your order with Vision Electronics, Inc. today. We look forward to serving all of your electronic supply needs. Vision Electronics Inc. is a multi-sourcing distributor. Shortage? Obsolete? Hard to find? Critical MRO needs?